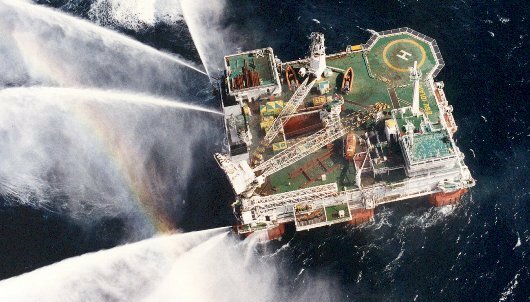 In September 1995, the BP Emergency Standby Vessel IOLAIR was purchased by Reading & Bates, for conversion into a Workover/Well Intervention Vessel. The IOLAIR is a self-propelled, twin hull, six column stabilized, semi-submersible type vessel. The proposed conversion included removal of some of the top structures, removal of the fire-fighting systems, closing of the dive tube and wave surge tank and the addition of a large derrick set and well stimulation equipment. These changes significantly affected the vessel's center of gravity as well as its wind area. The converted vessel had to meet the 1990 Department of Energy's Fourth Edition guidelines and the Lloyd's Register of Shipping requirements. Argonautics Marine Engineering, Inc. was hired to assist with the stability analysis of the vessel. Photograph courtesy of Reading & Bates Development Company. Comparison of various sponson configurations to improve the IOLAIR's stability/deck load capability.